Security System Installations in Fall River, MA | Basco Security, INC.
Fall River is known for its tenure as the leading textile manufacturer in the country during the 19th century. 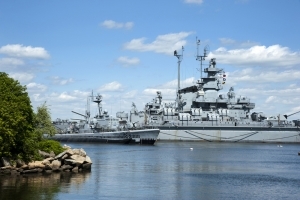 The city is home to several museums celebrating its rich history and culture, including Battleship Cove and Maplecroft. In the last several decades, there has been a housing boom due to the further development of the northern part of the city, with the population settling at 87,000. Fall River has a vibrant downtown area, housing the headquarters to several local chain restaurants. The city runs along the border of Massachusetts and Rhode Island, along the banks of the Taunton River. Basco Security is proud to include Fall River in our expansive service area, helping the community with their security needs. If you are taking the time to assess your home security needs, contact Basco Security today! We have been providing estimates and security installations on residential and commercial properties across Massachusetts since 1960 and look forward to helping you feel safer. Whether you are looking to improve smoke and fire detection or add a camera system to keep an eye on your property while you’re away, we will have a system that’s right for you. Basco Security can be reached by calling 781-294-4166 or by filling out our online contact form. If your current address has changed, please fill out the form HERE to update your information we have on fill!